, the son of the preceding, was born in the parish of St. Catherine, near the Tower of London, Oct. 14, 1644. He was sent to school at Chigwell in Essex, which was near his father’s residence at Wanstead; and afterwards, in his twelfth year, to a private school on Tower-hill; and he had also the advantage of a domestic tutor. 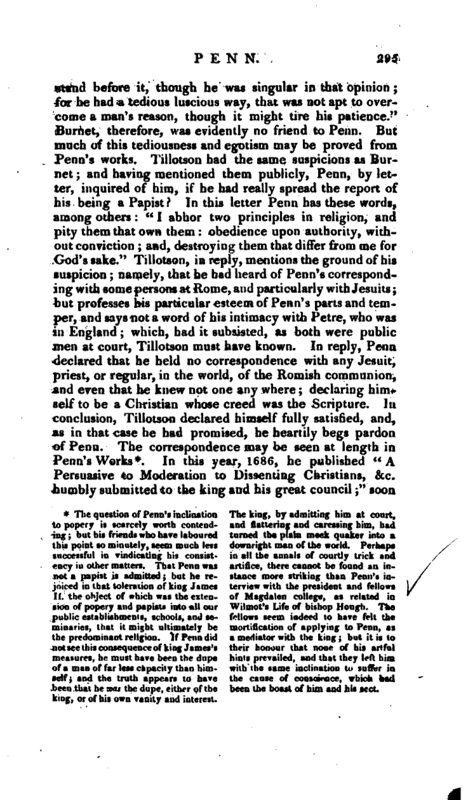 Penn relates, in a conference he had with some religious persons on the continent, that “the Lord,” as he expresses it, “first appeared to him about the twelfth year of his age; and that, between that and the fifteenth, the Lord visited him, and gave him divine impressions of himself.” Wood informs us, that during the time of Penn’s residence at this school at Chigwell, “being retired in a chamber alone, he was so suddenly surprized with an inward comfort, and (as he thought) an external glory in the room, that he has many times said how from that time he had the seal of divinity and immortality; that there was a God, and that the soul of man was capable of enjoying his divine communications.” It appears, that before this time, he had been impressed by the preaching of one Thomas Loe, a quaker, but no particulars of the circumstance are known; it is however incidentally mentioned, that it was by the same person that he was afterwards confirmed in his design of uniting himself with that sect. In 1660, he was entered a gentleman-commoner at Christchurch, Oxford where, although he is said to have taken great delight, at the times of recreation, in manly sports, he, with some other students, withdrew from the national forms of worship, and held private meetings, where they both preached and prayed among themselves. 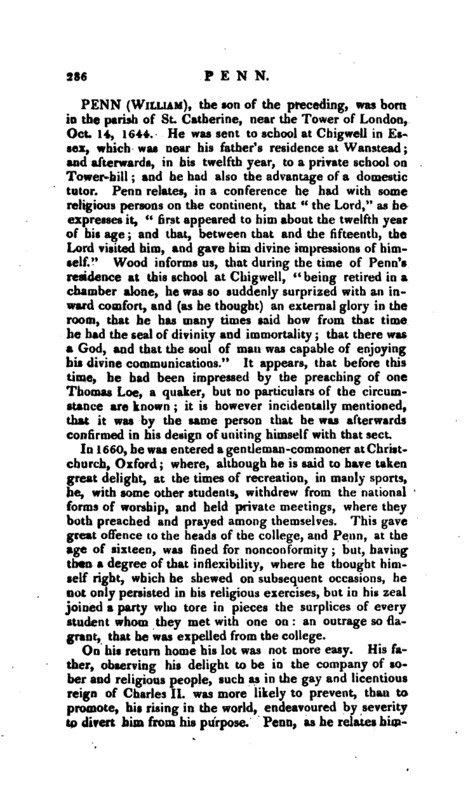 This gave great offence to the heads of the college, and Penn, at the age of sixteen, was fined for nonconformity; but, having then a degree of that inflexibility, where he thought himself right, which he shewed on subsequent occasions, he not only persisted in his religious exercises, but in his zeal joined a party who tore in pieces the surplices of every student whom they met with one on: an outrage so flagrant, that he was expelled from the college. On his return home his lot was not more easy. His father, observing his delight to be in the company of sober and religious people, such as in the gay and licentious reign of Charles II. was more likely to prevent, than to promote, his rising in the world, endeavoured by severity to divert him from his purpose. Penn, as he relates | himself, was whipped, beaten, and finally turned out of doors, in 1662. The father, however, either relenting, or hoping to gain his point by other means, sent his son to Paris, in company with some persons of quality who were travelling that way. In France he continued some time, and returned so well skilled in the language, and in the embellishments of a polite behaviour, that he was joyfully received by his father. During his residence in Paris he was assaulted in the street one evening by a person with a drawn sword, on account of a supposed affront; but, among other accomplishments of a gay man, he had become so good a swordsman as to disarm his antagonist. In one of his writings he very rationally condemns this barbarous practice, reflecting how small a proportion the omission of a piece of respect bears to the loss of life; which in this case might have been consequent upon the rencounter. After his return from France, he was admitted of Lincoln’s Inn, with the view of studying the law, and continued there till the memorable year 1665, when the plague raged in London. In 1666, his father committed to him the care of a considerable estate in Ireland, which occasioned him, for a time, to reside in that kingdom. At Cork he was informed, by one of the people called Quakers, that Thomas Loe, whose preaching had affected him so early in life, was shortly to be at a meeting in that city. To this meeting he went. 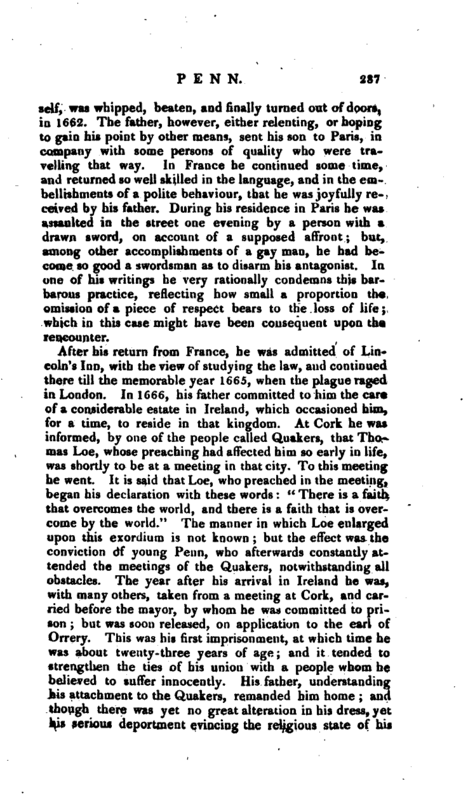 It is said that Loe, who preached in the meeting, began his declaration with these words: “There is a faith that overcomes the world, and there is a faith that is overcome by the world.” The manner in which Loe enlarged upon this exordium is not known; but the effect was the conviction of young Penn, who afterwards constantly attended the meetings of the Quakers, notwithstanding all obstacles. The year after his arrival in Ireland he was, with many others, taken from a meeting at Cork, and carried before the mayor, by whom he was committed to prison; but was soon released, on application to the earl of Orrery. This was his first imprisonment, at which time he was about twenty-three years of age; and it tended to strengthen the ties of his union with a people whom he believed to suffer innocently. 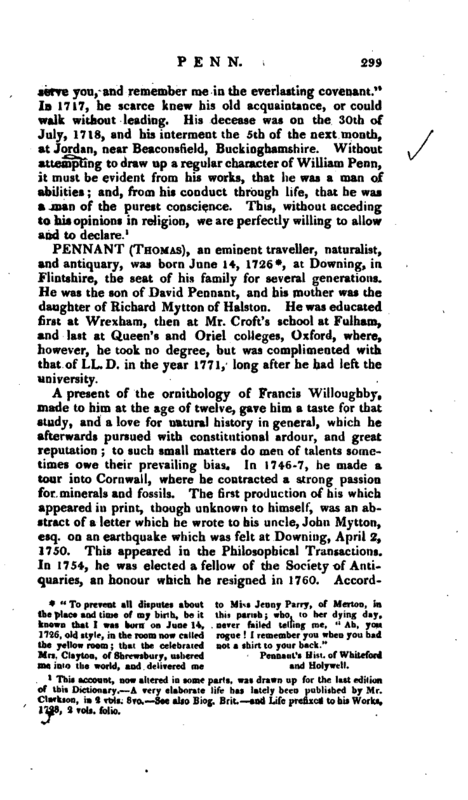 His father, understanding his attachment to the Quakers, remanded him home; and though there was yet no great alteration in his dress, yet his serious deportment evincing the religious state of his | mind, confirmed the fears of his father, and gave occasion to a species of conflict between them not easily described. The father felt great affection for an accomplished and dutiful son, and ardently desired the promotion of his temporal interests, which he feared would be obstructed by the way of life he had embraced. The son was sensible of the duty he owed to his parent, and afflicted in believing that he could not obey him but at the risk of his eternal welfare. At length the father would have compounded with the son, and suffered him to retain the simplicity of his manners to all others, if he would consent to be uncovered before the king, the duke (afterwards James II. ), and himself. Penn desired time to consider of this requisition; and having employed it in fasting and supplication, in order, as he conceived, to know the divine will, he humbly signified to his father that he could not comply with it. After this, the father being utterly disappointed in his expectations, could no longer endure the sight of his son, and a second time drove him from his family. In this seclusion he comforted himself with the promise of Christ, to those who leave house or parents for his sake. His support, outwardly, was the charity of his friends, and some supplies privately sent him by his mother; but, by degrees, his father, becoming convinced of his integrity by his perseverance, permitted him to return to the family; and, though he did not give him open countenance, he privately used his interest to get him released, when imprisoned for his attendance at the Quakers’ meetings. In 1668, he first appeared both as a minister and an author among the Quakers. We shall not pretend to give the titles of all his numerous tracts. His first piece has this title, which is very characteristic of the man “Truth exalted, in a short but sure testimony against all those religions, faiths, and worships, that have been formed and followed in the darkness of apostacy; and for that glorious light which is now risen and shines forth in the life and doctrine of the despised Quakers, as the alone good old way of life and salvation; presented to princes, priests, and people, that they may repent, believe, and obey. By William Penn whom Divine love constrains, in an holy contempt, to trample on Egypt’s glory, not fearing the king’s wrath, having beheld the majesty of him who is invisible.” The same year, on occasion of a dispute with Thomas Vincent, a Presbyterian, Penn wrote his “Sandy | foundation shaken which occasioned him to be imprisoned a second time in the Tower of London, where he remained about seven months; and from which he obtained his release also, by another book entitled” Innocency with her open face,“in which he vindicated himself from the charges which had been cast on him for the former treatise. In the Tower also he wrote his famous” No Cross no Crown,“or rather, probably, the first edition of it, of which the title was different. It may be esteemed his master-piece, and contains a strong picture of Christian morality. The complete title is,” No Cross, no Crown; a Discourse, shewing the nature and discipline of the holy Cross of Christ; and that the denying of Self, and daily bearing of Christ’s Cross, is the alone way to the Rest and Kingdom of God. To which are added, the living and dying testimonies of many persons of fame and learning, both of ancient and modern times, in favour of this treatise.“It has gone through several editions, and has been lately translated into French. After his release, he again visited Ireland, where his time was employed, not only in his father’s business, but in his own function as a minister among the Quakers, and in applications to the government for their relief from suffering; in which application he succeeded so well, as to obtain, in 1670, an order of council for their general release from prison. The same year he returned to London, and experienced that suffering from which his influence had rescued his friends in Ireland. The Conventicle-act came out this year, by which the meetings of Dissenters were forbidden under severe penalties. The Quakers, however, believing it their religious duty, continued to meet as usual; and when sometimes forcibly kept out of their meeting-houses, they assembled as near to them as they could in the street. At one of these open and public meetings in Gracechurchstreet, Penn preached, for which he was committed to Newgate, his third imprisonment; and at the next session at the Old Bailey, together with William Mead, was indicted for- 4 * being present at, and preaching to an unlawful, sed-tious, and riotous assembly.” He pleaded his own cause, made a long and vigorous defence, though menaced and ill treated by the recorder, and was finally acquitted by the jury, who first brought in a verdict of “Guilty of speaking in Gracechurch-street;” and when that was not admitted, a verdict of “Not guilty.” He was, | nevertheless, detained in Newgate, and the jury fined. The trial was soon after published, under the title of “The People’s ancient and just liberties asserted, in the Trial of William Penn and William Mead, at the Sessions held at the Old Bailey in London, the st, 3d, 4th, and 5th of September, 1670, against the most arbitrary procedure of that Court/‘ This trial is inserted in his works, and at once affords a proof of his legal knowledge and firmness, and of the oppression of the times. 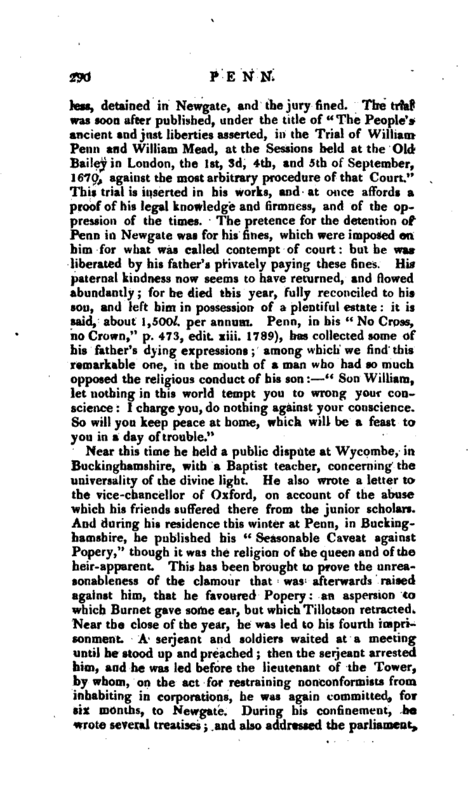 The pretence for the detention of Penn in Newgate was for his fines, which were imposed on him for what was called contempt of court: but he was liberated by his father’s privately paying these fines. His paternal kindness now seems to have returned, and flowed abundantly; for he died this year, fully reconciled to his son, and left him in possession of a plentiful estate: it is said, about 1,500l. per annum. 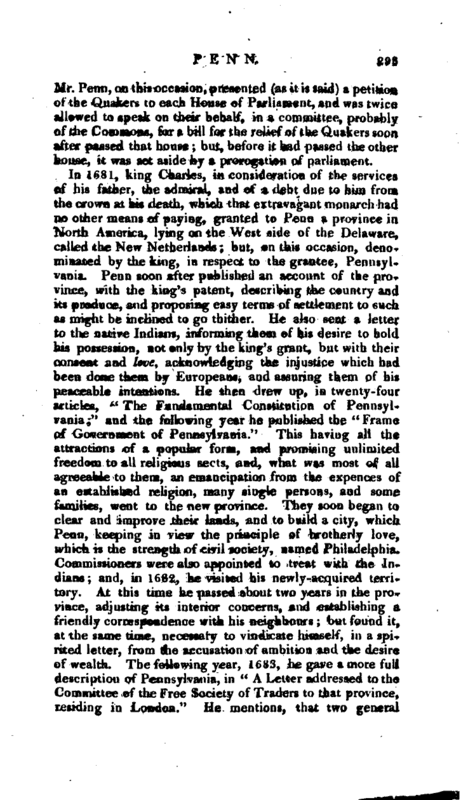 Penn, in his” No Cross, no Crown,“p. 473, edit. xiii. 1789), has collected some of his father’s dying expressions; among which we find this remarkable one, in the mouth of a man who had so much opposed the religious conduct of his son” Son William 1 let nothing in this world tempt you to wrong your conscience: 1 charge you, do nothing against your conscience. So will you keep peace at home, which will be a feast to you in a day of trouble." Near this time he held a public dispute at Wycombe, in Buckinghamshire, with a Baptist teacher, concerning the universality of the divine light. He also wrote a letter to the vice-chancellor of Oxford, on account of the abuse which his friends suffered there from the junior scholars. And during his residence this winter at Penn, in Buckinghamshire, he published his “Seasonable Caveat against Popery,” though it was the religion of the queen and of the heir-apparent. This has been brought to prove the unreasonableness of the clamour that was afterwards raised against him, that he favoured Popery: an aspersion to which Burnet gave some ear, but which Tillotson retracted. Near the close of the year, he was led to his fourth imprisonment. A serjeant and soldiers waited at a meeting until he stood up and preached; then the serjeant arrested him, and he was led before the lieutenant of the Tower, by whom, on the act for restraining nonconformists from inhabiting in corporations, he was again committed, for six months, to Newgate. During his confinement, he wrote several treatises; and also addressed the parliament, | which was then about to take measures for enforcing the Conventicle Act with greater severity. Shortly after the release of Penn from this imprisonment, he travelled, in the exercise of his ministry, in Holland and Germany. Few particulars of this journey are preserved; but it is alluded to in the account of a subsequent one which he published. In 1672, he married Guliehna Maria Springett, whose father having been killed at the siege of Bamber, in the civil wars, and her mother having married Isaac Penington of Chaifont, Bucks, in his family (which was a place of general resort for Quakers in that county) Gulielma had her education, and probably became acquainted with Penn. After his marriage he resided at Rickmansworth, in Hertfordshire. The same year he wrote several controversial pieces; and, among the rest, one against Muggleton. In this employment, about this time, he seems to have spent much of his leisure. 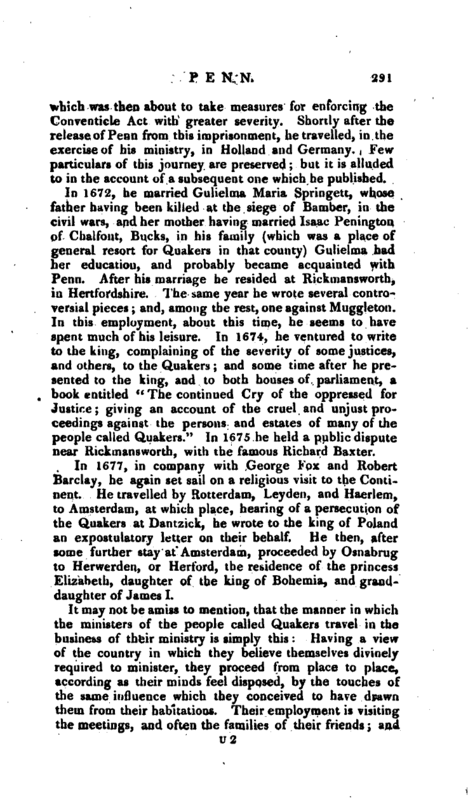 In 1674, he ventured to write to the king, complaining of the severity of some justices, and others, to the Quakers; and some time after he presented to the king, and to both houses of parliament, a book entitled “The continued Gry of the oppressed for Justice; giving an account of the cruel and unjust proceedings against the persons and estates of many of the people called Quakers.” In 1675 he held a public dispute near Rickmansworth, with the famous Richard Baxter. In 1677, in company with George Fox and Robert Barclay, he again set sail on a religious visit to the Continent. He travelled by Rotterdam, Leyden, and Haerlem, to Amsterdam, at which place, hearing of a persecution of the Quakers at Dantzick, he wrote to the king of Poland an expostulatory letter on their behalf. He then, after some further stay at Amsterdam, proceeded by Osnabrug to Herwerden, or Herford, the residence of the princess Elizabeth, daughter of the king of Bohemia, and granddaughter of James I. 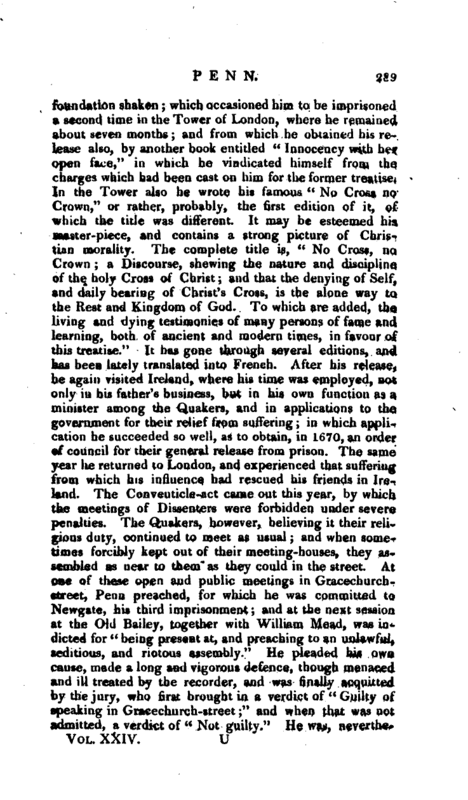 It may not be amiss to mention, that the manner in which the ministers of the people called Quakers travel in the business of their ministry is simply this: Having a view of the country in which they believe themselves divinely required to minister, they proceed from place to place, according as their minds feel disposed, by the touches of the same influence which they conceived to have drawn them from their habitations. Their employment is visiting the meetings, and often the families of their friends and | sometimes appointing move public meetings for the information of persons of other societies, whom also they visit, at their duty or inclination leads them. This seems to have been the case with Pcnn and his companions, whose principal business at HerwerJen was in visiting the princess and her family. She received them with great readiness, and they remained four days at her town, in which time they had many religious opportunities, both for worship and conference, with her and in her house, one of which was open to the inhabitants of the town. On leaving Herwerden, he took a circuit in Germany, by Cassel, Francfort, Chrisheim, Manheim, Mentz, Cologne (called by himself Cullen), Mulheim, Wesel, Cleve, and Nimeguen; and returned to Amsterdam in less than a month after he had loft it. 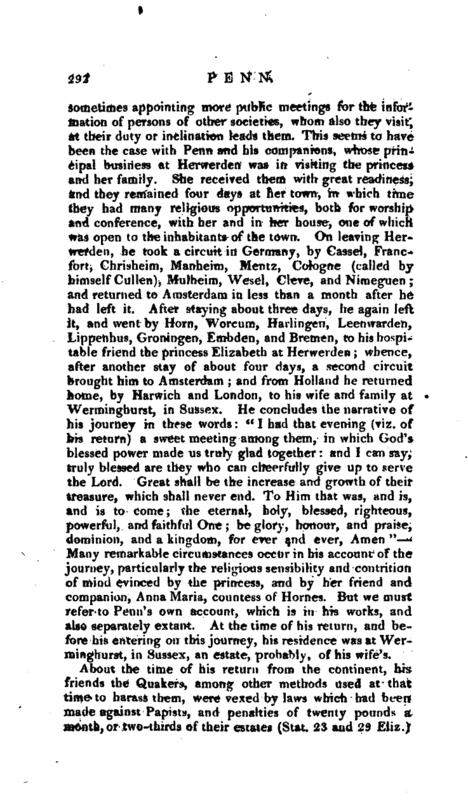 After staying about three days, he again left it, and went by Horn, Worcum, Harlingen, Leenwarden, Lippenhus, Groningen, Embden, and Bremen, to his hospitable friend the princess Elizabeth at Herwerden; whence, after another stay of about four days, a second circuit brought him to Amsterdam; and from Holland he returned home, by Harwich and London, to his wife and family at Werminghurst, in Sussex. He concludes the narrative of his journey in thvse words: “I had that evening (viz. of his return) a sweet meeting among them, in which God’s blessed power made us truly glad together: and I can say, truly blessed are they who can cheerfully give up to serve the Lord. Great shall be the increase and growth of their treasure, which shall never end. To Him thai was, and is, and is to come; the eternal, holy, blessed, righteous, powerful, and faithful One; be glory, honour, and praise, dominion, and a kingdom, for ever and ever, Amen.” Marty remarkable circumstances occur in his account of the journey, particularly the religious sensibility and contrition of mind evinced by the princess, and by her friend and companion, Anna Maria, countess of Homes. But we must refer to Penn’s own account, which is in his works, and also separately extant. At the time of his return, and before his entering on this journey, his residence was at Werminghurst, in Sussex, an estate, probably, of his wife’s. About the time of his return from the continent, his friends the Quakers, among other methods used at that time to harass them, were vexed by laws which had been made against Papists, and penalties of twenty pounds a month, or two-thirds of their estates (Stat. 23 and 29 Eliz.) | Mr. Penn, on this occasion, presented (as it is said) a petition of the Quakers to each House of Parliament, and was twice allowed to speak on their behalf, in a committee, probably of the Commons, for a bill for the relief of the Quakers soon after passed that house; but, before it had passed the other house, it was set aside by a prorogation of parliament. been that he was the dupe, either of the been the boast of him and his secy king, or of his own vanity and interest. | after which came out the king’s proclamation for a general pardon; which was followed, the next year, by his suspension of the penal laws. 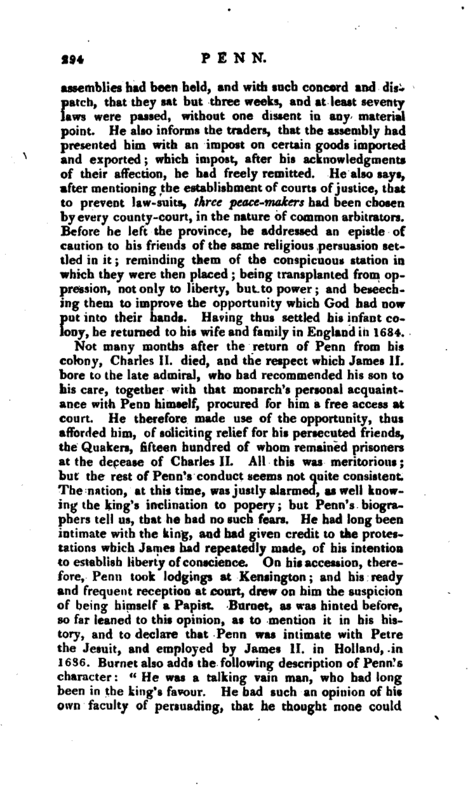 Penn presented an address of the Quakers on this occasion. He also wrote a book ort occasion of the objections raised against the repeal of penal laws and test; and, the clamour against him continuing, he was urged to vindicate himself from it, by one of his friends, Mr. Popple, secretary to the Plantation -office, which he did in a long reply, dated 1688. But he had now to cope with more powerful opponents than rumour. The revolution took place, and an intimate of James was of course a suspected person. As he was walking in Whitehail, he was summoned before the council then sitting; and, though nothing was proved against him, he was bound to appear the first day of the following term; but, being continued to the next on the same bail, he was then discharged in open court: nothing being laid to his charge. In the beginning of 1690, he was again brought before the council, and accused of corresponding with James. They required bail of him as before; but he appealed to the king himself, who, after a long conference, inclined to acquit him; nevertheless, at the instance of some of the council, he was a second time held a while to bail, but at length discharged. Soon after this, in the same year, he was charged with adhering to the enemies of the kingdom, but proof failing, he was again cleared by the court of King’s-bench. 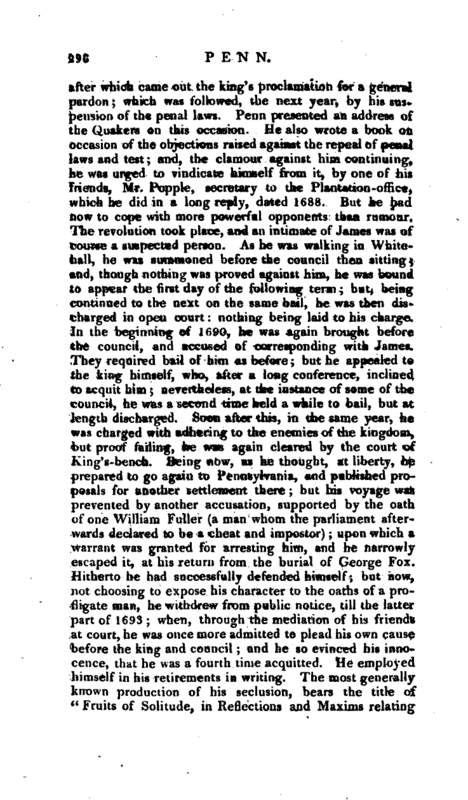 Being now, as he thought, at liberty, he prepared to go again to Pennsylvania, and published proposals for another settlement there; but his voyage was prevented by another accusation, supported by the oath of one William Fuller (a man whom the parliament afterwards declared to be a cheat and impostor); upon which a warrant was granted, for arresting him, and he narrowly escaped it, at his return from the burial of George Fox. Hitherto he had successfully defended himself; but now, not choosing to expose his character to the oaths of a profligate man, he withdrew from public notice, till the latter part of 1693; when, through the mediation of his friends at court, he was once more admitted to plead his own cause before the king and council; and he so evinced his innocence, that he uas a fourth time acquitted. He employed himself in his retirements in writing. 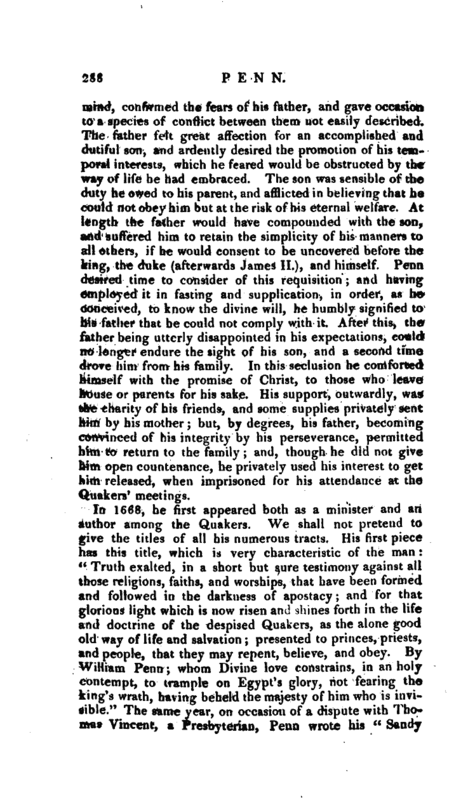 The most generally known production of his seclusion, bears the title of ’“Fruits of Solitude, in Reflections and Maxims relating | to the conduct of human life;” and another not less valued by his sect is his “Key, &c. to discern the difference between the religion professed by the people called Quakers* and the perversions, &c. of their adversaries, c.” which has gone through twelve editions at least. Not long after his restoration to society, he lost his wife, which affected him so much, that he said all his other troubles were nothing in comparison of this; and he published a short account of her character, dyr?g expressions, and pious end. The following year, he appeared as the eulogist of Geor.ge Fox, in a long preface to Fox’s Journal, then published. 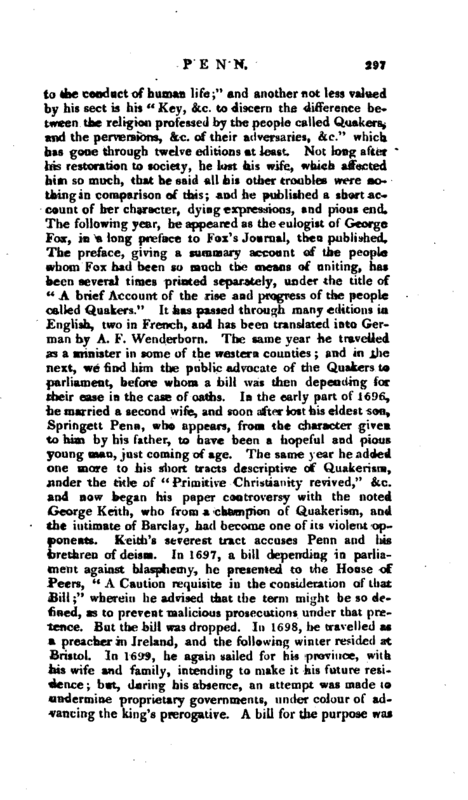 The preface, giving a summary account of the people whom Fox had been so much the means of uniting, has been several times printed separately, under the title of “A brief Account of the rise and progress of the people called Quakers.” It has passed through many editions in English, two in French, and has been translated into German by A. F. Wenderborn. The same year he travelled as a minister in some of the western counties; and in the next, we find him the public advocate of the Quakers to parliament, before whom a bill was then depending /for their ease in the case of oaths. In the early part of 1696, he married a second Wife, and soon after lost his eldest son, Springett Penn, who appears, from the character given to him by his father, to have been a hopeful and pious young man, just coming of age. The same year he added one more to his short tracts descriptive of Quakerism, under the title of “Primitive Christianity revived,” &c. and now began his paper cpntroversy with the noted George Keith, who from a champion of Quakerism, and the intimate of Barclay, had become one of its violent opponents. Keith’s severest tract accuses Penn and his brethren of deism. In 1697, a bill depending in parliament against blasphemy, he presented to the House of Peers, “A Caution requisite in the consideration of that Bill” wherein he advised that the term might be so defined, as to prevent malicious prosecutions under that pretence. But the bill was dropped. In 1698, he travelled as a preacher in Ireland, and the following winter resided at Bristol. In 1699, he again sailed for his province, with his wife and family, intending to make it his future residence; but, during his absence, an attempt was made to undermine proprietary governments, under colour of advancing the king’s prerogative. A bill for the purpose was | brought into parliament, but the measure was postponed until his return, at the intercession of* his frienrls; who also gave him early information of the hostile preparations, and he arrived in England the latter part of 1701. After his arrival, the measure was laid aside, and Penn once more became welcome at court, by the death of king William, and the consequent acce>sion of queen Anne. On this occasion, he resided once more at Kensington, and afterwards at Knightsbridge, till, in 1706, he removed to a convenient house about a mile from Brentford. 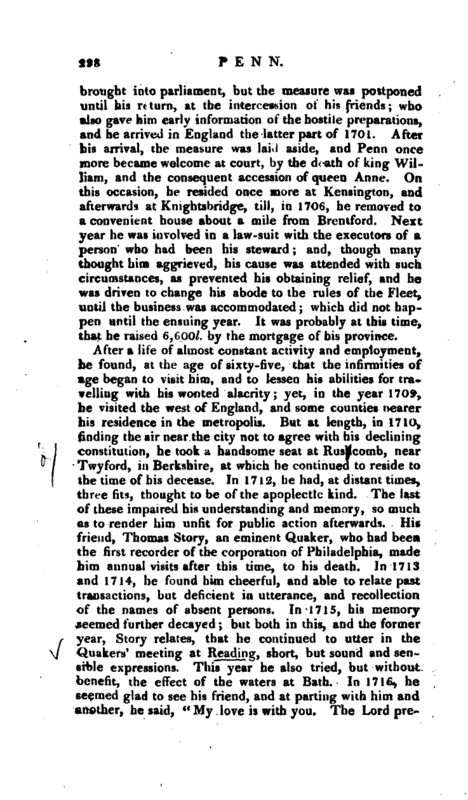 Next year he was involved in a law-suit with the executors of a person who had been his steward; and, though many thought him aggrieved, his cause was attended with such circumstances, as prevented his obtaining relief, and he was driven to change his abode to the rules of the Fleet, until the business was accommodated; which did not happen until the ensuing year. It was probably at this time, that he raised 6,600l. by the mortgage of his province. This account, now altered in some parts, was drawn up for the last edition of this Dictionary. A very elaborate life has lately been published by Mr. Clarkson, in 2 vols. 8vo. See also Biog. Brit. and Life prefixed to his Works, 1728, 2 vols. folio.